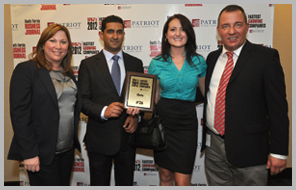 Miramar, FL -- June 25, 2012- Chetu Inc., a leading Software Development and IT Solutions provider, is pleased to announce that it has been officially awarded the #26 position in the South Florida Business Journal list of South Florida's Top 50 Fastest Growing Companies. Rankings were based on 2010-2011 revenue growth percentages. Chetu grew at 55.3%, year over year. In a local ceremony, the award was accepted by Jane Powell, Director of Global Sales, Retail & Strategic Solutions and Bhartendu Sharma, VP of Operations. "Kudos to our fantastic team! Even when times are rough posting such stellar numbers is a testament to our quality of delivery and hence Customer Retention. Delivering high quality and on time solutions continues to be the key factor in our success. Add to that is new business acquired by our Sales team", said Atal Bansal, CEO, Chetu Inc. "All credit goes to our Sales and Operations team. Each member of the Chetu family equally contributed to this success." Chetu is a 12-year old provider that delivers World-Class IT Solutions serving entrepreneurs to Fortune 500 clients. With a growing team of over 500 skilled engineers spread across eight global locations, it is able to provide a unique delivery model that blends an onsite / offsite team in a setting that fits customer's budget, yet does not compromise on local interaction or real time collaboration. Beyond providing IT resources, Chetu also excels in providing industry specific and niche technology solutions. Be it Healthcare, Retail, Finance, Telecom, Gaming, Hospitality, Travel, E-Learning, Supply chain or others. Its services include process and systems design, package implementation, custom development, business intelligence and reporting, systems integration, as well as testing, maintenance and support. Chetu's expertise spans across the entire IT spectrum.